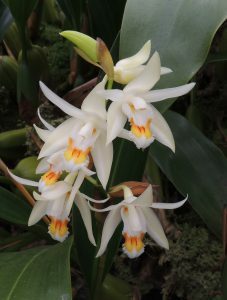 Today’s orchid is this giant coelogyne species from the Himalayas. 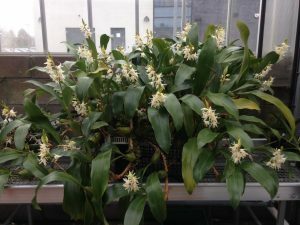 This plant of Coelogyne stricta has been growing at Writhlington since 1995 when it arrived as a single bulb and the plant is now 2m across. 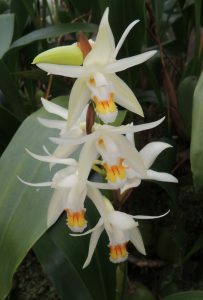 Each year it produces long upright spikes of around 15 fragrent white flowers with lovely yellow and orange lip markings. The species is native to the Himalayas and we have seen some wonderful specimen plants flowering in the forests of Sikkim at around 2000m altitude in cool moist monsoon forest. One plant in particular had completely enveloped the trunk of a large tree – a real site. 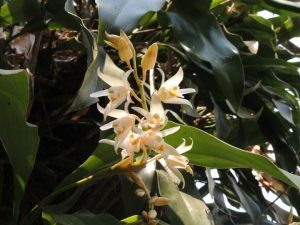 The photo shows a close view of flowers on a plant near Tinkitam in Sikkim.